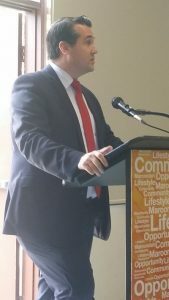 U3A Croydon welcomed the commitment from the federal minister for Deakin, Michael Sukkar last Wednesday to allocate $2.2million towards new premises for U3A Croydon. U3A Croydon’s new home will be part of a larger project, the Croydon Community Precinct, a major redevelopment of the Civic Square area. U3A Croydon will act as a consultant to Maroondah City Council, who will manage the project, to ensure the new home meets the needs of our members. Keystone Complex, 1 Civic Square, Croydon, VIC, 3136. Copyright © 2019 U3A Croydon. Website template by Bar Bending Designs. V 3.0.